By analysing discussions on social media and newspaper articles, in this exploratory we study public debates to understand which are the most discussed topics. We can identify themes, following the discussions around them and tracking them through time and space. How does people discuss on online social networks? Who are online social network users that take part in political debate? What is the structure of their social network? In this story we focus on online debates about discussing topics. By using data from online social networks, we analyze people discussions about topics that are relevant for society. We will investigate who attends debates, how people discuss, and what are their social relationships compared with those of people of different views. We try to understand also how politicians discuss and they influence other people. We made visualization to represent the user social network and topics evolution. What does newspapers talk about? Is it possible to understand when a specific theme becomes relevant for the media? Are there some topics that become interesting for all journalists at the same time? In this story we analyze german newspaper articles to understand the most relevant topics and monitoring how they are discussed by press. We made a visualization that shows the most frequent topics in a certain period of time. In our visualization each word is weighed on the basis of its meaning and it has reference on space and time. Thanks to this study it twill be possible to identify interesting topics automatically, before to start studies each topic. Browse Societal Debates resources in SoBigData Catalogue. We try to estimate flows and stocks from available data in real time, by building models that map observed measures extracted from unconventional data sources to official data. Since migration might generate cultural changes on the local and incoming population, we evaluate the migrants integration in new communities through social network and retail data analysis. Furthermore, SoBigData.it supports datajournalism projects on migration. We partner with the team of “Demal Te Niew”, the webdocumentary on migration between Italy and Senegal published on L’Espresso and El Pais. 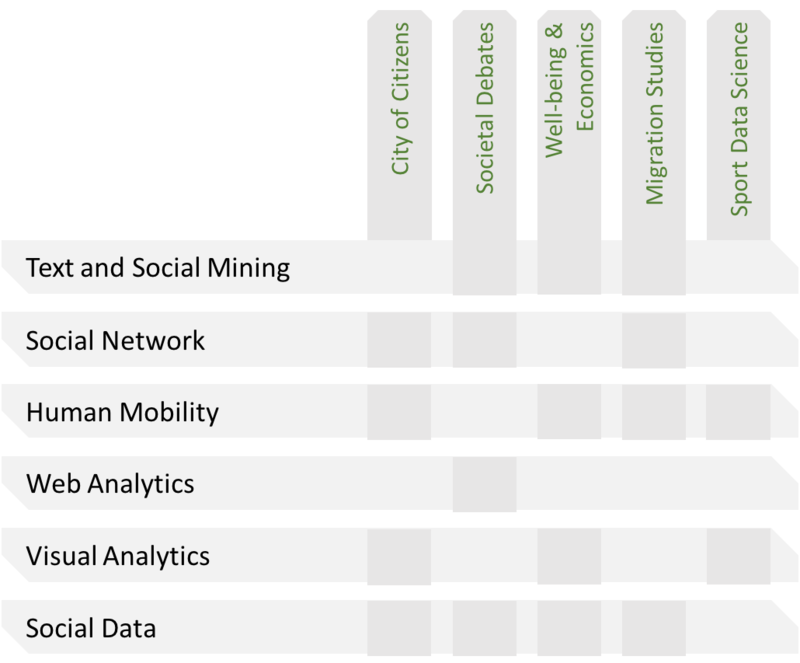 SoBigData covers six thematic areas: text and social mining, social network, human mobility, web analytics, visual analytics and social data. These general areas are presented in specific vertical applications in specific fields to help better explore the potentiality of them in real world problems. In the SoBigData Resource Catalogue you can navigate the methods and datasets in both the dimensions or filter by any combinations of the two. Discover examples and tutorials about these Exploratories in the E-infrastructure and access their methods and datasets.